VARIABLE SPEED LIMITS and multiple point tolling should be introduced on the M50. That is the opinion of Engineers Ireland, which yesterday released its infrastructure report The State of Ireland 2017. The report says that the main motorway in Dublin needs to have drastic steps taken to reduce congestion. It says that Ireland’s overall transport system is “mediocre and inadequately maintained”. 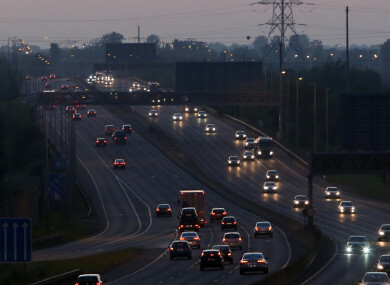 As part of the plan to improve things, the engineers suggest that the M50 have “variable speed limits and multi-point tolling to avoid an impending congestion crisis in the short-term” within two years. Within five years, the group recommends that the Eastern Bypass plan be pursued. This would see the M50 made a fully circular route, linking the Port Tunnel with the M50 through the city’s southside. That plan was rejected in May last year by Dublin City councillors. Latest figures from Transport Infrastructure Ireland, show that the portion of the M50 operating at free or stable flow decreased by 10% between 2015 and 2016. “In Dublin, there should be additional circular routes to link outer suburbs and relieve the pressure on the M50. “The use of intelligent transport systems (ITS) coupled with the introduction of variable speed limits and multi-point tolling on the M50 should help mitigate an impending crisis on this route. The report goes on to say that the Luas Cross-City should be extended to the north-west of Dublin to terminate and exchange with the M50. Email “Engineers want multiple tolls and changing speed limits on the M50”. Feedback on “Engineers want multiple tolls and changing speed limits on the M50”.